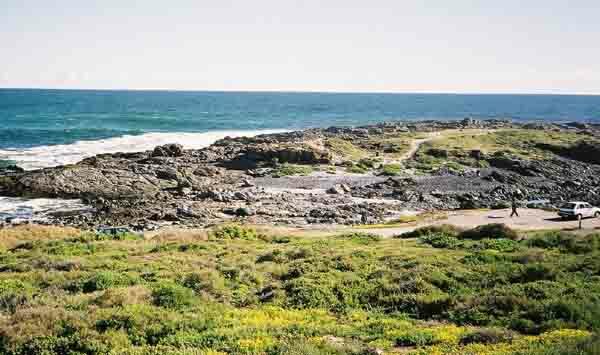 Yzerfontein also known as Ysterfontein is a small village on the west coast of South Africa about 90 kilometres from Cape Town. Its been around for a long time and used to be a whaling station. 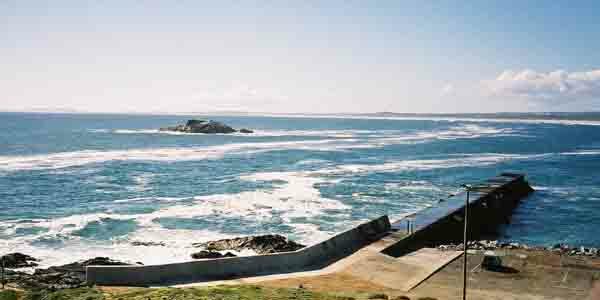 During the time that it was used as a whaling station a jetty was built on the left side of the Yzerfontein Bay as you face west at right angles to the coastline. It is still there today but has lost a bit of its length due to some severe storms it has been faced with over the years. The jetty is built at right angles to the waves and takes the full force of the sea. If there is a large swell running waves break over it and it is extremely dangerous to venture onto it. It was built of large cement blocks which were placed at odd angles on top of each other. Some of the blocks which were laid on top of each other like bricks have been washed off during the storms. Today this jetty is only used for fishing. Over the years crayfish have made their homes in the cracks between the blocks and people spend hours fishing for them. Of course it is time well spent as the crayfish that come out from under the jetty are normally quite large. You would be unable to purchase crayfish that size in a restaurant in SA today. If you could it would cost an absolute fortune. On the inside of the jetty another breakwater has been built at right angles to the old one and it faces east and forms a small basin which allows the fishing boats to launch in any weather. 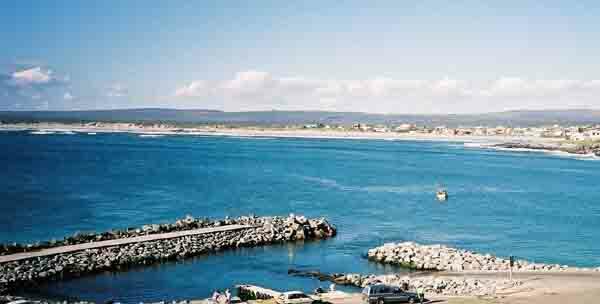 Yzerfontein is a well known fishing harbour these days and many thousands of snoek are landed there each day. (A fish that looks a bit like a barracuda) The harbour is guarded on the south by a ridge which has a steep face on the harbour side and forms a large hill which is about a kilometre wide and reaches down to the sea on the south side. Where old whaling station buildings used to stand people have built some very large and fancy houses. The houses have a super view over the harbour and the Yzerfontein Bay which circles around to the east from the old jetty. In the bay about a kilometre from the end of the jetty is a large rock in the sea. It's a small island and is used by birds as a landing spot.During rough weather the sea breaks over it sending spray high into the air. 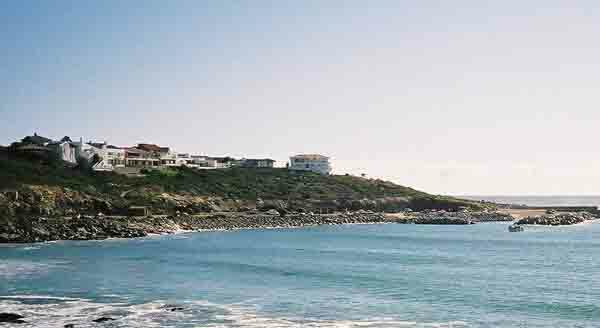 From the houses on the ridge above the harbour you can also watch the swells rolling across the bay and breaking onto the white sands of Yzerfontein beach. 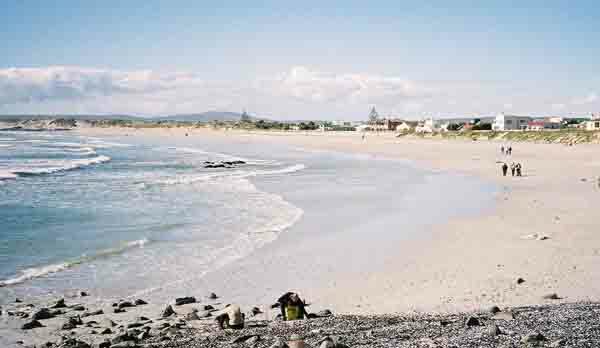 This beach which is in pristine condition with lovely snow white sand runs northwards up the coast for about 19 miles before it reaches the land mass which forms the barrier between the Langebaan lagoon and the sea. 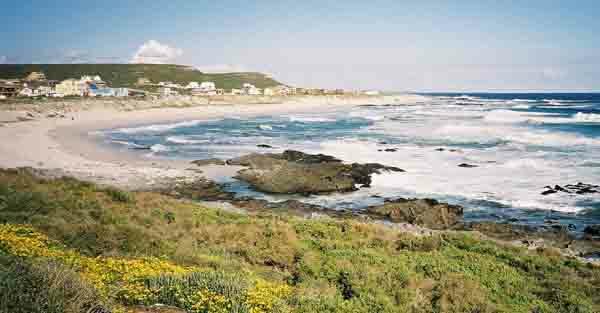 What is really nice about the Yzies Bay is all the marine life that visits it. I was sitting fishing off some rocks one day and about 200 dolphins arrived and proceeded to play in the sea in front of me. They put on a big display of jumping out of the water and flipping and all sorts of fun things. What I saw that day could never be repeated in a dolphinarium. During the whale season the whales sometimes enter the bay. If they don't come in you can see them blowing plumes of water off the coast if you watch carefully. This week I spent a few days visiting Yzies and did some fishing off the rocks around the corner to the south of the jetty. Where I was fishing I had the most incredible view . To my left was Schapeneiland (Sheep Island) which is an outcrop of land about 200 square metres in size. It becomes an island at high tide when the sea flows through the channel between it and the land. Directly behind it I could see Table Mountain in the distance with its white table cloth. Its about 60 kilometres away as the crow flies. A truly beautiful sight! In front of me was an outcrop of rocks about 500 metres across the small bay in which I was fishing. While I watched a number of seals swam into the bay and proceeded to climb up onto the rocks and sun themselves. Its the first time I have seen them there and no doubt there will be more of them next time I go there. Directly behind this outcrop of rocks is Dassen Island which is about 10 kilometres away. Most of the fishing boats which use Yzerfontein to launch go out to the island to fish. I spent two evenings in this spot fishing and for a change I had some luck. I caught two Hottentot,(Bronze Bream) not very large but at least I caught something. I put them back so that they could grow bigger. The best part of my sitting on the rock was the two sunsets I experienced. The first evening there was a bit of fog about and as the sun set it dropped out of the fog and one could see this great big ball of fire dropping into the sea. The second evening there were a few clouds just above the horizon and as the sun sank into the sea it first turned the clouds pink and then set them on fire with a beautiful orange glow that changed all the time and then disappeared as the sun sank below the horizon. On both sides of the hill I have described there are the most fantastic views. Many people have taken advantage of the land that is still available and built themselves houses overlooking the beaches. To experience this jewel on the west coast come and visit us here in Cape Town.